It is essential for the overall quality of the project that the URLs within your website can be reached. Particularly important pages are those which contain links from external webpages. 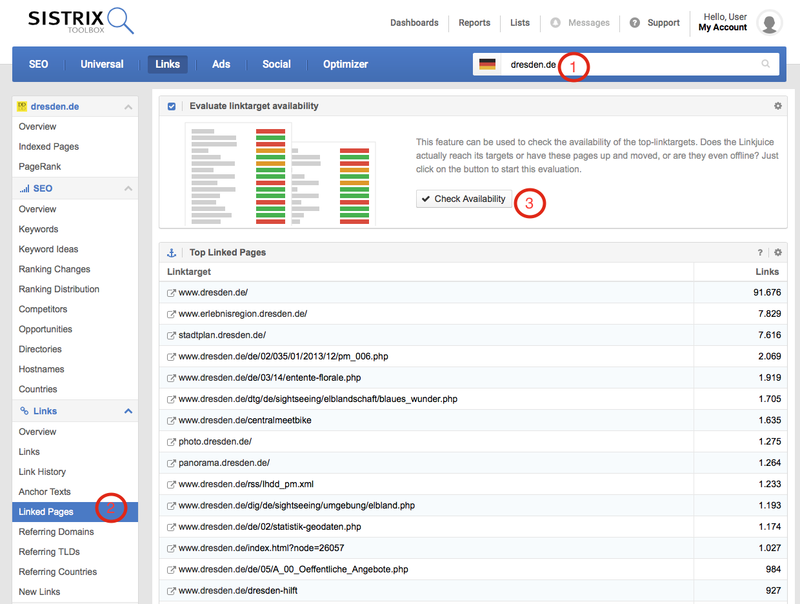 The SISTRIX Toolbox shows these pages in the link module, in the section “Linked Pages”. You have just updated your website. Beforehand you came up with a plan to correctly redirect the changed URLs. To make sure everything went according to plan, you should use the SISTRIX Toolbox to check the availability of the top link destinations. Below we show you exactly how to do this. Type your domain into the Toolbox searchbar. In this tutorial I am using the domain dresden.de, where a website update took place. After typing in the name of the domain, you switch into the link module in the left-hand navigation by clicking on “Links > Linked Pages”. You will now see the following display. Step 3 is a click on the button “Check Availability“. 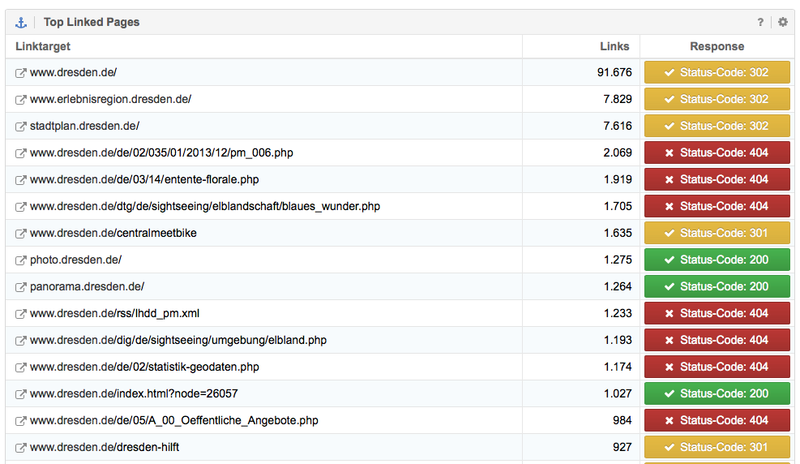 This will start our crawler, which will check all top link destinations, in real-time. The progress and status can be seen on the same page in the last column of the table. As you can see, many top link destinations lead to a 404 error page. For some URLs, a permanent redirect has been put in place. The homepage of the blog, however, does not display the desired statuscode 200, but instead shows a temporary redirect (302). The goal should be to maintain the availability of all top link destinations (statuscode 200) or to at least redirect the old URLs to their new, relevant counterparts using a 301 redirect. You should regularily check the availability of the pages on your websites – independently of an update. Pages with content you really do not want to be shown anymore should be set up to correctly show a 404 status code. For the creation of a 404 page, Google also has some helpful tips in store for you. After an update you should also check your project in the SISTRIX Optimizer The Optimizer gives your useful tips for the on-page optimisation of your website and will detect mistakes and other weaknesses. When you are using the Optimizer, your goal should be to put your website into an optimal state as far as the current requirements for search engine optimisation are concerned.